For over 20 years, the DSI team has specialized in providing top Hollywood professionals on the Bel Air Circuit with exceptional private home theater systems. This highly specialized field requires a delicate balance of commercial AV skills with residential AV skills. When deploying professional cinema equipment in a home, careful engineering, planning, and design is required to make the room a success and easy to use. DSI specializes in the artful integration of equipment, the blending of consumer video sources (broadcast TV, gaming, streaming video services), and the simplification of operation for the homeowner. We can help you navigate through the myriad of Bel Air Circuit options such as 4k, Dolby Atmos, 3-D, Auro 3-D sound, HDR, and high-frame rate. As a firm, we understand the needs of a private residence so we do not treat our rooms or users as if they are on a commercial studio lot. For the past twenty years, our passion has been to create amazing screening rooms in Beverly Hills, Malibu and the general Los Angeles area for equally amazing filmmakers. Rooms where their art can be reproduced in the very best way possible. 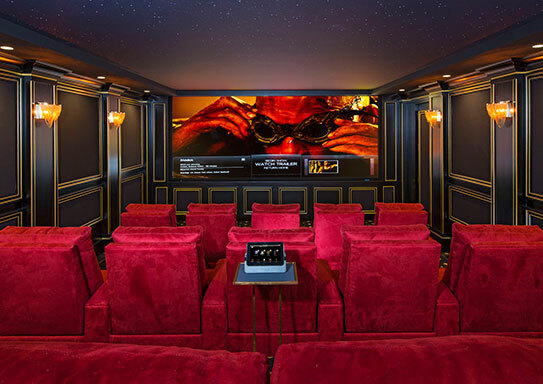 Let us know how we can help you create the screening room of your dreams.